Why Do Some Small Beads Cost More Than Larger Beads? Have you ever been surprised to see that a strand of 2mm or 3mm beads were more costly than the same length strand of 8mm? There is a reason that smaller beads are sometimes more expensive than larger. For one thing, when the stone cutter is forming smaller beads, more rough material goes to waste. Larger beads take up more room on the rough material so there is more finished yield. And don’t forget – you get almost twice as many beads on a strand of 2mm than you do on a strand of 4mm! Another reason is that making smaller beads is more labor-intensive. Cutting, finishing and stringing tiny beads takes much more time. One of the nice things about smaller gemstone beads is that they can be used sparingly to great effect. Tiny gemstone beads can be used to pick up the colors of larger cloissone beads, or used for fringe, or for a loop around a decorative button to form a clasp. 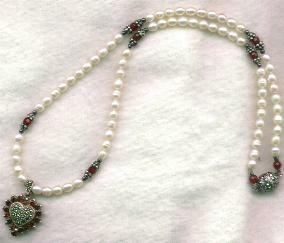 In the picture below, although you can’t see it very well, I used some 3mm hematite on either side of the Bali beads surrounding the garnets, and they gave just enough of a space and echoed the marcasite so that I was perfectly happy with my design! I have in my “personal stash” some 2 and 3mm rosequartz and hematite I can’t wait to use! Here’s a handy list for your design book. Birthstone jewelry is always popular, and don’t forget that you needn’t be strict about this – crystals in these colors will work just as well! I have been thinking about ways people use beads to promote charitable causes – I often see advertised in magazines bracelets for breast cancer, for instance. A friend who is a mammographer makes pink beaded breast cancer support pins to give to her patients, and also gives a portion of her profits from the breast cancer support jewelry she makes to the Susan G. Komen Foundation. Here are a few stories about creating jewelry for non-profit organizations and other worthwhile causes. A while ago, I was approached by a women’s organization. One of their members had recently been diagnosed with ALS (commonly known as Lou Gerhig’s Disease.) Some of the members had seen a bracelet made with Swarovski crystal cubes and diamond-shaped beads, sterling silver balls and bali beads, with a sterling silver heart shaped clasp and dangling charm. They wanted to make something similar as a fund-raiser. Together we designed a bracelet using Chinese crystal AB cubes and bicones, silver-plated round beads, pewter Bali-like flower spacers, a pewter heart-shaped clasp and pewter charm. We used Beadsmith Cyclone crimps so that they would not need special tools, and the bracelets were strung on .019 SoftFlex. The materials came in at under $8 for each bracelet, and they sold over 600 for $25 each. Although we used lower priced materials, the bracelet was quite beautiful and well worth $25. Additionally, the group had fun meetings where the members assembled the bracelets – you could buy them either ready made, or come to a party and make your own. I thought this was an original twist. You may know that almost every charitable organization (especially those pertaining to a particular disease) has its own signature color or symbol; pink for breast cancer, for instance or the puzzle piece for Autism. One of my customers does a whole line of different bracelets using the colors and symbols from different charitable organizations and also representing different branches of the military. She earmarks part of her profits for the corresponding group. Recently a woman came into my store looking for help with her son’s project. Kyle Spivak was preparing for his Bar Mitzvah by doing a project which was designed to support charitable organizations. Kyle’s project is called “Pookas for Peace,” (pookasforpeace.com). Kyle made shell necklaces which include the colors of both the Israeli and the Lebanese flag, as symbol of peace for the region. 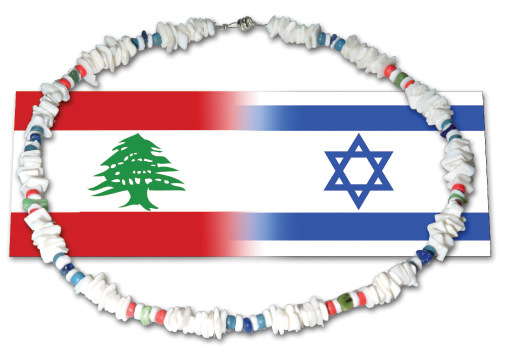 All profits are being split equally between Lebanese and Israeli charities. Using beads for fundraising and awareness is a good way to promote the causes you feel close to, and to promote yourself. Even if you don’t care to do a whole line of jewelry devoted to a charity, donating your work for the PTA silent auction, or other worthy cause is a good way to get your work seen and to do some good in this world!